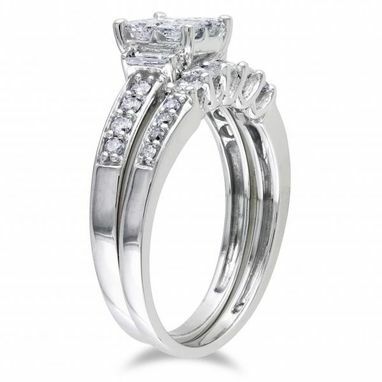 This diamond bridal set has two stunning rings for your lady love. The approximately one carat of diamonds that come together in this preset engagement ring and wedding band bridal set have been professionally chosen. Four, near colorless, princess cut center stones sit pretty, flanked by baguette and channel set round diamond side stones in the engagement ring. When it's time to head to the altar, the matching wedding band with pave and prong set round diamonds add that extra sparkle to the bridal set. 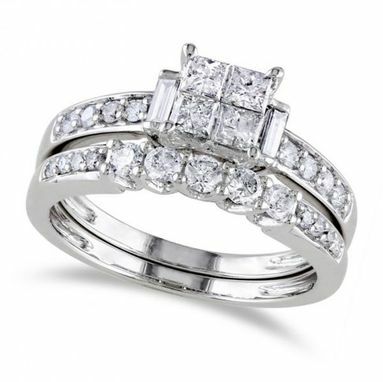 With 23 diamond side stones, this 14k white gold bridal set, is sure to sweep your lady off her feet.